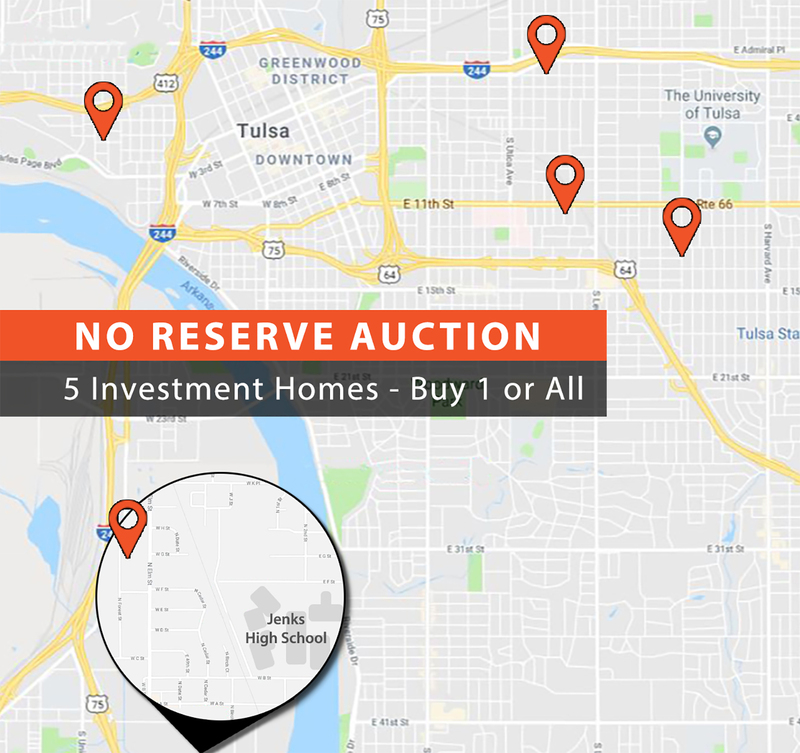 Five investment properties are being offered without reserve on September 20th giving you an opportunity to purchase one or more properties in various areas of the Tulsa Metro. These properties are located in several of the up and coming areas such as University of Tulsa neighborhood, Jenks, downtown and other transition areas of Tulsa. The five properties range from approximately 849sf to 1345sf per county records and offer a variety of bedroom/bath sizes. Vinyl-sided home located near Jenks High School. Original wood floors, 0.22+/- acre lot with mature trees and chain link fence. Jenks is one of Oklahoma’s fastest growing cities offering attractions such as the Oklahoma Aquarium, Flying Tee, downtown shopping area and a wide variety of restaurants. Former duplex converted to a single-family residence located 5-blocks east of Hillcrest hospital near the intersection of South Lewis avenue and 11th Street. Original wood floors. Kitchen, living room and separate utility. Covered front porch. Fenced back yard with dog run on side yard. Bell Addn. Partially renovated single-family residence located 3-blocks south of TU. Home renovation started but not completed. Exterior in good condition, interior is down to the studs. Kitchen, living area and separate utility. Covered front porch. Fenced backyard and storage shed. Rosemont Heights Addn. Single-family residence located 1/2-mile west of the BOK Center. Corner lot with mature trees. Walking distance to Newblock Park and Joe Station Dog Park. Overlook Park Addn. 3% Buyer’s Premium applies to this sale. Buyers-premium is an additional fee (3% of high-bid amount) paid by the high-bidder. All bidders must register with CJ Auctions prior to bidding (registration is held 1-hour prior to auction) and provide a driver’s license or government-issued identification. By the Dollar and Buyer’s Choice. Buyer(s) Choice is a method of sale whereby all parcels for a given grouping are on the table. Once the high bid is reached the bidder has their choice in one parcel, all parcels, or any combination. Once high bidder picks their parcel(s) the process starts over until all parcels are gone. 105 S Xanthus REMOVED FROM AUCTION. Partially renovated single-family residence located just off I-244 near Utica. Original wood floors, living room with gas fireplace and basement. Kitchen has breakfast area, separate dining room and utility closet. Two bedrooms upstairs. Mudroom accessed from backyard. Gillette-Hall Addn.